Nintendo has brought the press conference portion of E3 2018 to an end in the best way it knows how - with charm and fun. We may not have seen a new Animal Crossing title or Bayonetta 3, but Nintendo certainly gave us our fill of Smash Bros. information. If you missed the conference, don't worry! We've rounded up the five most exciting announcements to come from the Nintendo Direct E3 2018 event. Until now, we had only seen a teaser trailer for Nintendo Switch's Super Smash Bros., but creator Masahiro Sakurai gave us a lengthy presentation on what we can expect from the latest addition the the franchise - Super Smash Bros. Ultimate. The new title seems to build on the Wii U version, but with a lot more content. Super Smash Bros. Ultimate includes every Smash Bros. fighter we've seen to date including Snake, Ice Climbers, and Pichu. 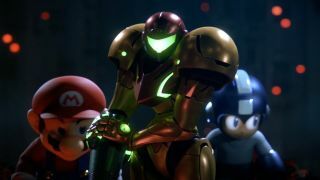 Metroid's Ridley and Splatoon's Inklings have also been added as brand new fighters, as well as Echo fighter Daisy, and female versions of Pikachu and Pokémon trainers. We will also see Assist Trophies including BomberMan, a variety of new Pokémon, and Midna - with K.O.-ing assists gaining you points. The actual gameplay has been improved, too. The graphics are better, air dodge mobility has been improved, fighters have more expressions, and one-on-one battles will result in greater damage. So, where will you be playing? Stages from previous games will make a return, such as Princess Peach's Castle, Spirit Train, and the Green Hill Zone. We can also look forward to a new Breath of the Wild-inspired stage - Great Plateau Tower. In addition, GameCube controller support has been added and all Smash Bros Amiibos are compatible. Sakurai also hinted online battles may be coming in the future. Super Smash Bros. Ultimate will release for Nintendo Switch on December 7, 2018. It's been almost two years since Nintendo announced it's bringing a new, proper Fire Emblem title to Nintendo Switch - and we finally know what it is. Fire Emblem: Three Houses has finally been unveiled, complete with a full-length trailer. It looks like the newest addition to the franchise is returning to the traditional top-down strategy elements we loved about the core games in the series. The animation style isn't hard on the eyes either. Fire Emblem: Three Houses will release for Nintendo Switch in spring 2019, or sometime around March through May. Super Mario Party is coming to Nintendo Switch! This will be the franchise's first entry to hit the console and it looks like it'll be a blast. Super Mario Party keeps the same boardgame elements the series is known for, while introducing a heap of new mods, mini-games, and characters. Of course, because it's the Switch, there's also Joy-Con enabled minigames and the ability to combine switches for four-player game modes, allowing characters to move across the screens. Super Mario Party will release for Nintendo Switch on October 5, 2018. Thanks to a leak, we already knew Fortnite is coming to Nintendo Switch. It's no surprise, considering Fortnite Battle Royale is the hottest game around right now. The Switch version has all the same chaotic building, cringe-worthy dancing, and fierce shoot-outs as its counterparts. Even better, it's free-to-play. Fortnite is available to download for Nintendo Switch from 10am PT / 6pm BST today. Hell's most charming kitchen is back and this time things are even hotter. Team 17's Overcooked 2 adds new a heap of levels - like the cemetery and hot air balloon - which will see you cooking up a storm in the air, at land and sea. If that's not enough for you, there are new cooking options including baking, BBQ, and broiling and new abilities such as being able to throw ingredients at your teammates. Plenty of ways to burn the kitchen down. Overcooked 2 will offer both wireless local and online play. So, you can stress out with strangers or with your closest friends. Overcooked 2 will release for Nintendo Switch on August 7, 2018.